Can White House hopefuls win over Millennials? 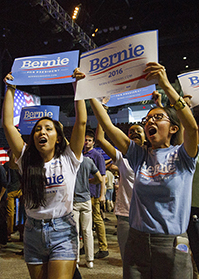 As the 2016 presidential election approaches, candidates are trying especially hard to show they're heeding the concerns of voters in their teens, 20s and mid-30s, known as Millennials. Many political experts say the 75-million-member group — the country's biggest generation — is up for grabs. Indeed, a recent poll showed 40 percent of under-30 voters call themselves politically independent, with 37 percent identifying as Democrats and 22 percent as Republicans. Well-educated and more technologically savvy than older voters, they share a distaste for traditional political posturing. They have proved — most notably with Barack Obama's presidential elections in 2008 and 2012 — that they can mobilize behind a politician who connects with them. Democrats and Republicans are embracing many of the causes that young voters consider important, such as education, student debt and entrepreneurship. The campaigns and political parties also are devoting considerable attention to getting out their messages on popular social-media sites such as Snapchat and Facebook.